This event did not only drew fellow democrats and supporters of President Obama, but iconic public figures and speakers like Mayor Marty Walsh, City Councilwoman Ayanna Pressley, Sen. Ed Markey, the current Massachusetts Governor Deval Patrick and of course the First Lady of the United States of America Michelle Obama, to endorse and commend Martha’s work and stance on early education for children, food nutrition, public safety, equal pay for women, human trafficking and raising awareness on domestic violence. Also in support of Martha Coakley, Lt. Governor candidate Steve Kerrigan was recognized, by the foray of speakers, for his public service– who I also had the pleasure to interview at the UR Business Network studio. A special thank you to Ladarrel Hagans for inviting me to this event. 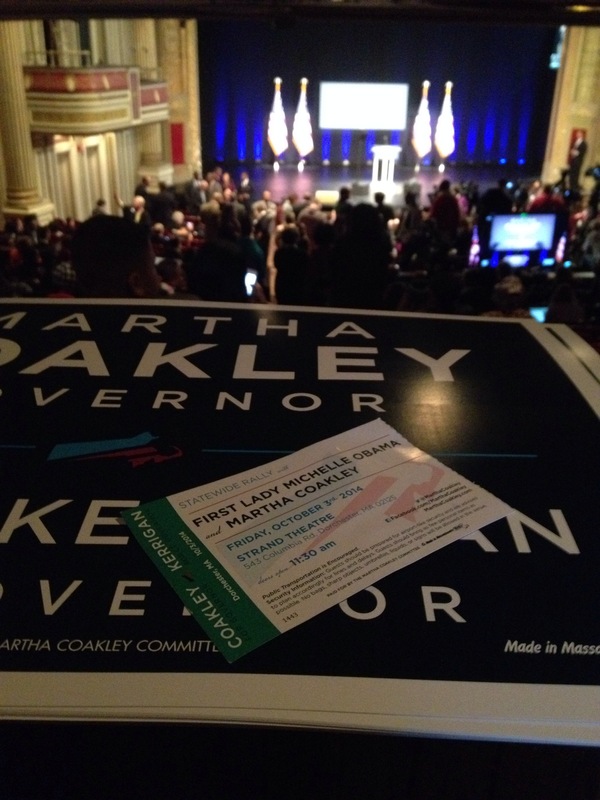 Previous Press Coverage: Martha Coakley Rally Event!